An album from 1987 which sold less than 5,000 copies on release, this is essentially a side project by the percussionist from the band, the Feelies –Dan Weckerman here taking the role of lead vocalist and songwriter. A reissue being released in time for Record Store Day, ‘Shore Leave’ is considered something of a lo-fi indie classic by fans of the Feelies, the latter releasing four albums between 1980 and 1991. ‘Shore Leave,’ the title track, comes in sounding a bit like the Fire Engines mixed with a mellower Husker Du, while ‘Spinning,’ and the quietly tense ‘Return to Zion’ are archetypal examples of the Hoboken sound that was a mainstay of college radio from this era. Of the 11 songs on the album, there are 3 cover versions – Neil Young’s ‘Powderfinger,’ the Rolling Stones’ psychedelic b-side ‘Child of the Moon’ and ‘Big Day,’ a Brian Eno song that was originally included on a Phil Manzanera solo album. 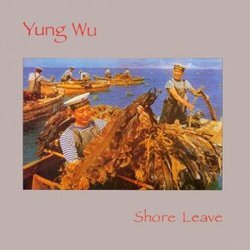 This could be construed as representing something of lack of creativity on the part of Yung Wu, but is more likely indicative of the fact this was intended as a fun venture rather than a creative statement – and in truth – none of the covers adds hugely to the originals, most being worthy but unexciting versions. ‘Bad Day’ is fairly typical, a song stripped down to its essentials, with ringing guitars and Stan Demeski’s martial sounding drumming, but it never really takes flight. Overall, while ‘Shore Leave’ is an evocative mix of slight, 1980s jangle pop, it’s unlikely to prove particularly exciting to anyone other than Feelies’ fans who missed out when the album was first issued. Reissue of Feelies side project from 1987.